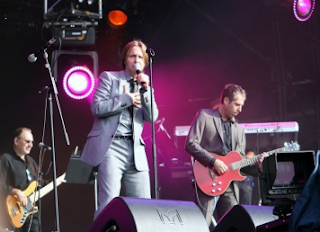 The band Johnny Hates Jazz are currently working on finishing up the recording of a brand new album. Best known for their hit 'Shattered Dreams' from their 1988 album 'Turn Back The Clock'. Frontman Clark Datchler has reunited with band member Mike Nocito to record their first new album since 1991's 'Tall Stories' (that album didn't include Clark as he left the band after the first record, then Phil Thornalley joined the band as lead vocalist). In 2010 the band toured Europe and South East Asia and have been working on a new album since that tour. Some promising news about the album, Clark and Mike recently reunited with arranger and composer Anne Dudley (Art Of Noise) to record a 16-piece string section on 3 tracks for the new cd. Anne, who arranged and conducted strings on 'Turn Back The Clock', will also be adding keyboards to the same tracks. Also working on the recordings are guitarist Dave Munday and keyboard player Pete Watson from HURTS touring band. For the latest information on the new Johnny Hates Jazz album you can follow Clark on Twitter.